Take a fascinating class of Perykivka painting under the guidance of a professional artist. During a private workshop, you will learn the basic techniques of petrykivka painting, included on the UNESCO Representative List of the Intangible Cultural Heritage of Humanity. After practicing, you will create your own Perrykivka painting and take it with you as a souvenir from Ukraine. It is an excellent pastime for people interested in Ukrainian traditions. We invite you to visit a local artist, who will teach you a beautiful art of Petrykivka. You will get the introduction to the history of the world famous Ukrainian art of Petrykivka and get practical instructions of painting from an expert artist. This art dates back to the 19th century when this painting was widely used in the decorations of the interiors in Petrykivka village, Dnipro region. 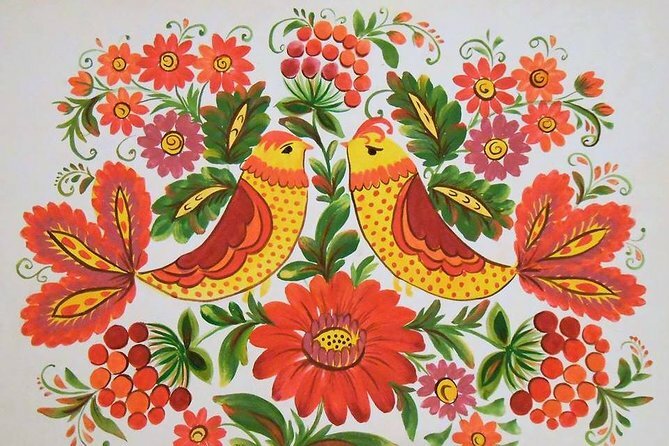 In 2013, Petrykivka painting was included on the UNESCO Representative List of the Intangible Cultural Heritage of Humanity as a phenomenon of the Ukrainian ornamental folk art. One of the advantages of this workshop is that it doesn’t require any special artistic skills – everyone can participate. The master will give you step-by-step instructions and tips and you will practice your brushstroke before painting a picture. Besides, you will see some beautiful samples of Petrykivka ornament that you may use as an idea for your work. The distinctive characteristic of Petrykivka is a prevalence of floral patterns, like leaves, flowers, viburnum berries, grapes, blossoms and sunflowers. The most popular colors are red, yellow, green and blue. You will spend a cheerful time and get a fantastic cultural experience! As the result, you will create your own bright and vivid picture that you will take home as a souvenir from Ukraine. Departure Time: Your chosen time (workshop is available daily, from 10am till 3pm). Please, specify the desired departure time of your tour while booking.